Naturally hot Scotch Bonnet Peppers give this sauce the zing you love! Jamaicans gave the name Scotch Bonnet to their hottest pepper as the shape reminded them of the Scots that came to colonize Jamaica. Cousin to the Habanero pepper but sweeter, it is the one of hottest peppers in existence - and it makes this sauce the go to bottle for flavor! Made with all natural ingredients, and 12% scotch whisky, you know you are going to love it. Make a Braveheart Burger - the recipe is on the bottle! 3.2 ounce bottle. Suitable for vegetarians. Malt Barley, vinegar, soy sauce(water, soy beans, wheat, salt), Scotch Malt Whisky 12%, sugar, lemon, garlic, molasses, Scotch Bonnet Peppers(2%), spices. Contains Soy and Wheat Gluten. 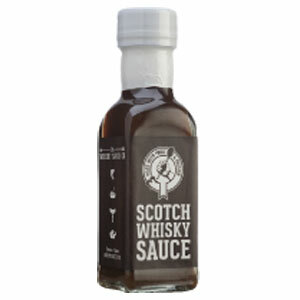 The Whisky Sauce Company is the brain child of Ken Andrew, who cooked up his signature Scotch Whisky Sauce first in 2008. Selling his wares at local Scottish weekend markets, he sent us an email this past summer and offered us a chance to buy his Whisky Sauce and Whisky Vinegar. We're glad he did, as we went through the samples bottles in no time! 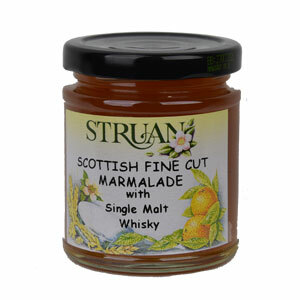 Based in Dundee (known for its Marmalade and Dundee cakes), we think it will soon be known for its Whisky Sauces. I once tried this sauce on haggis a few years ago and ever since then, haggis just seems boring without it. I absolutely love the way the taste of the two mesh together.